After my recent softie flop, I am now very happy to say that I have had some success! 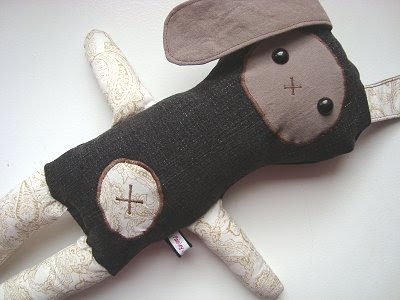 Here is a new bunny style - watch out for more in the shop soon. 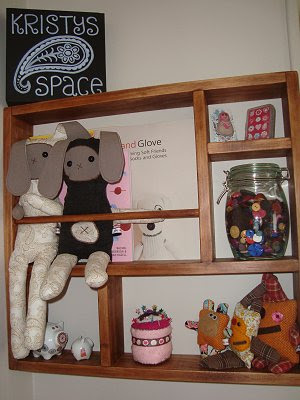 I do like these two (especially the paisley fabric and their cute little faces), and have them currently sitting in my new shelf that hubby made to go above my sewing desk... isn't he sweet! Oh - and I must say a big THANKS to Rachel Kate for giving me the excess fabric from her new black denim jeans - the top softie is very thankful for her body! I'm finding it hard to shake off the softie making bug (when it does come) and last night was sneaking into my room to sew softies while the dinner was waiting to be dished up. I'm off bowling tonight with a few mums from our coffee group, so will have to wait until another night to get back into it. What things do you love to do when you have time?? 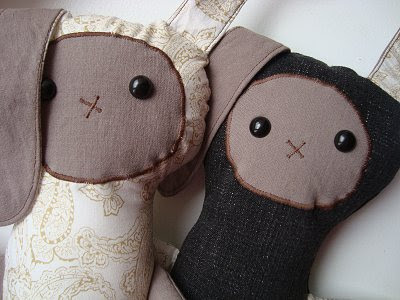 In theory is doesn't make any sense, considering they are simply made of fabric, "eyes" and a "mouth", but those little faces are extremely sweet and full of character and expression - magic! Oh, and I also really like the fabric. I love to knit when I have the time. I am currently sewing a great big quilt for my daughter's 13th birthday on Wednesday - as usual I leave everything until the last minute and will probably still be sewing it into the wee hours of Wednesday, silly me!